Nancy seems to be afraid of her. I truly cannot recall a more 'entertaining' political figure in the past 30 years. One day in the not so distant future we'll be looking back at how conservative Pelosi was. 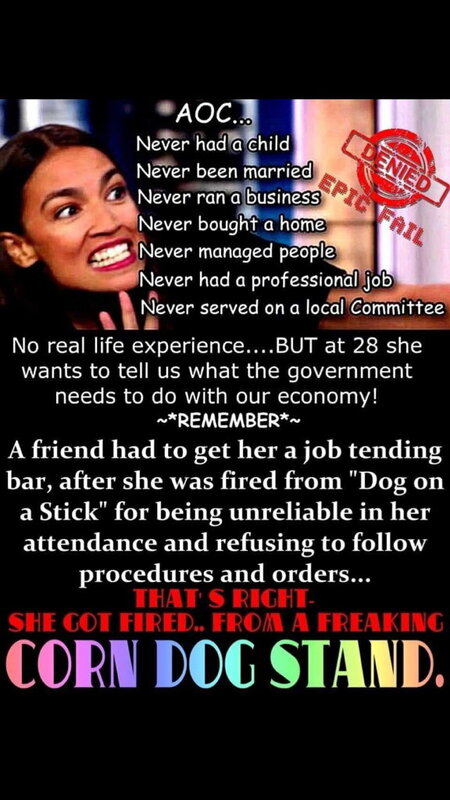 AOC is the model for future liberals to follow. They will not settle for anything less than the total destruction of America. For such a useless person she has a rather high opinion of herself. I find the circular firing squad on the left quite entertaining. Please let her be the face of the DNC in 2020!!!!!!! Do you really want that? Seven exclamation marks worth of want? Who do you think will motivate more voters to "dump Trump", Elizabeth Warren or AOC? You don't need to be worried about what she knows, doesn't know, her inexperience, her lack of anything resembling a qualification... you should probably be worried about her ability to motivate. She only motivates the weak minded. The rest of the country thinks she's an ignorant fool. Right... and which of those two groups represent the majority? Despite what you would like to believe, the Pussyhat Community is a small minority. That may be true, but you referenced the "weak minded" which I believe represents the majority. But I get it... if you voted for Trump you're you're immune and if you didn't you have a weak mind, yes? WTF? You're going off on another odd tangent. Sorry if your feelings are hurt about Occasional-Cortex's appeal nationwide. She actually got fired from a hot dog stand? Nothing worse than a moron with self esteem. The vote is a public record. The media will MAKE her look good, no matter what she says or does. Constitutional question here. Is there a minimum age to be Vice President? If not, she will be in the running. The people who want to see her as the face of the DNC in 2020 aren't paying attention. Last edited by Dr Bee; 03-04-2019 at 10:40 AM. Depending how much popular support she can actually garner and keep, it truly is concerning. Everything she represents is an anathema to this country's traditional values, and to see her gain traction - indeed concerning. She isn't winning any moderates or those who already voted for trump. He will tear her apart. Lemme guess, she thought ti was an adult novelty store?